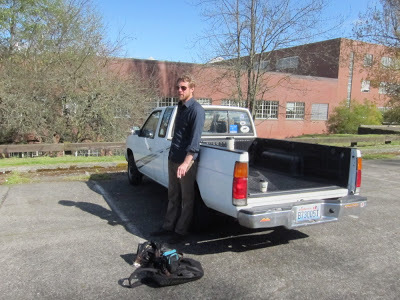 The University of Washington runs the biggest art program in Seattle, and when I was out there last week, first-year MFA student Travis Davis Smith picked me up at the airport and took me to the MFA studios, which are housed in an old navy base. 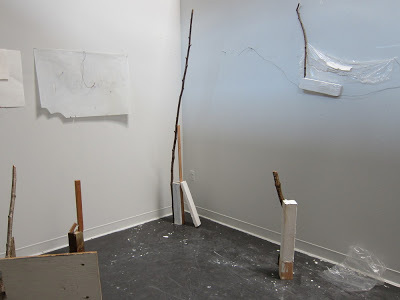 Smith is working on small-scale sculptures created by arranging found materials in precarious situations. He entered the program as a painter, but his work has taken an unexpected turn. 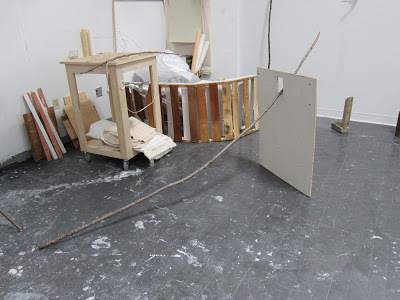 Sometimes, Smith says, he returns to the studio and is pleasantly surprised to find that pieces have fallen apart. He likes the notion that things change. Attached to a one-story brick building, this rock climbing wall sits next to the old barracks that houses the MFA studios. Imagine how vivid the color of that painted sky looks on Seattle’s dark, dreary days. 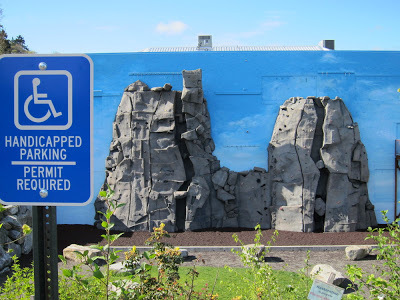 Here’s Smith having a smoke in the parking lot while I gush over the painted rock-climbing wall (pictured above). 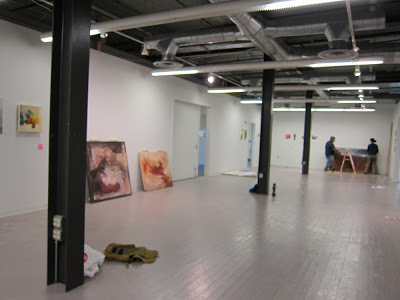 The MFA barracks also houses a gallery where they were hanging the BFA show. receives $12,500, and, in addition, the gallery buys a piece for their permanent collection. have become part of a mysterious, and possibly contentious, narrative. 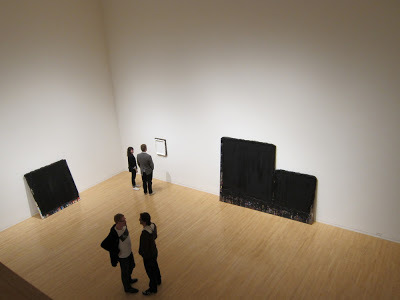 Overall, the exhibition lacked focus. I would have appreciated these thick gooey monochromes even more without the belabored explanation. Photographs of the painted lawns were on display, too, but they should have been in a smaller supporting role rather than enlarged, framed and scattered throughout the exhibition. Or perhaps Dadson could have focused more strongly on the painted landscapes and brought the objects into the gallery rather than presenting photographs that wavered indecisively between documentation and formal art objects. 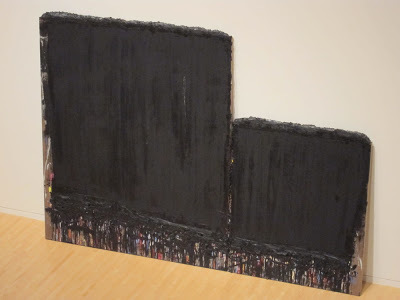 As the work is arranged now, the connection between the paintings and the landscape images strikes me as notional and contrived rather than organic, but the exhibition’s shortcomings have to do with the installation (and statement) rather than the work itself. In The Stranger, check out Jen Graves’s article about the 2011 Brink Awards shortlist. Also at the Henry: “Glossodelic attractors,” a big Gary Hill rotating video retrospective took up several of the other galleries. Note to the folks at the vertigo-inducing Rem Koolhaas library: The Gary Hill video installation either wasn’t turned on properly or wasn’t working last week. More Studio Visits with Seattle Artists. Yes, the more we read artist statements the more we realize how unnecessary they are. 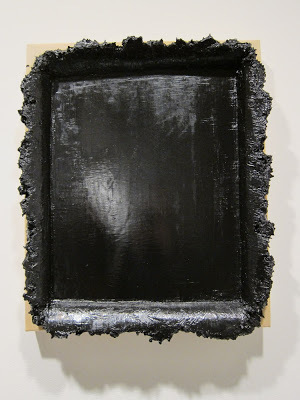 I like the black painting that looks like a tray.